I am having a Caesar salad moment right now. I think it's the warm summer weather that has me craving them. I love a good dinner salad in the summertime, but these flavors take me back to childhood summers at my grandparents' cottage. One of my grandmother's specialties was homemade Caesar dressing, so my summer days were spent swimming and my nights with eating bowls of delicious Caesar salad. Restaurant Caesars can be really bad for you, I know. Fatty dressing, buttery croutons, tons of cheese... But this summer I just can't get enough of these salads-- from chicken Caesar wraps at the Jersey Shore a few weeks ago to my lunchtime splurge Tuscan Kale Caesar at Mercato by Fabio Viviani to several dinners of skinny steak and chicken Caesar salads made at home, I've been eating them all summer and I'm not done yet. This recipe is a great summer dinner. It's served cold, it makes great lunch leftovers (always a plus in my book), and it is a mashup of two of my favorite foods: Caesar salad (of course) and pasta. 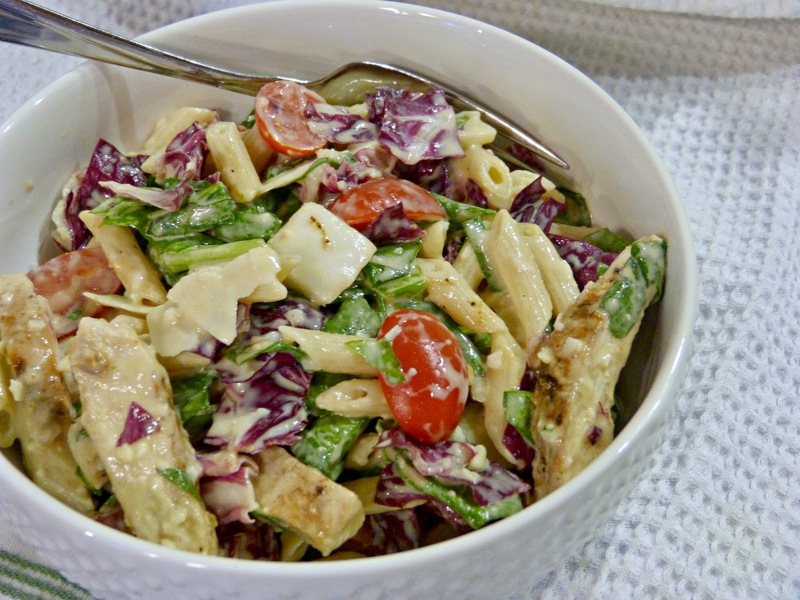 This pasta salad features great Caesar flavor, tons of lean chicken protein, and a little sweetness from fresh tomatoes. I also swapped out the traditional Romaine lettuce here because it often becomes wilted and soggy once tossed in dressing-- it is best enjoyed shortly after the salad is prepared. For this pasta salad I used a combination of hearty spinach and radicchio, both of which add great flavor and texture to the salad. A little fresh Parmesan finishes the whole thing off and you've got a simple and delicious one dish summer dinner. Heat oil in a saute pan over medium high heat. Season chicken breasts with garlic, salt, and pepper. Brown the chicken breasts on both sides and saute until cooked through and juices run clear. Transfer to a plate and allow the chicken to cool. When cool enough to handle, cut chicken into 1/2-inch slices. 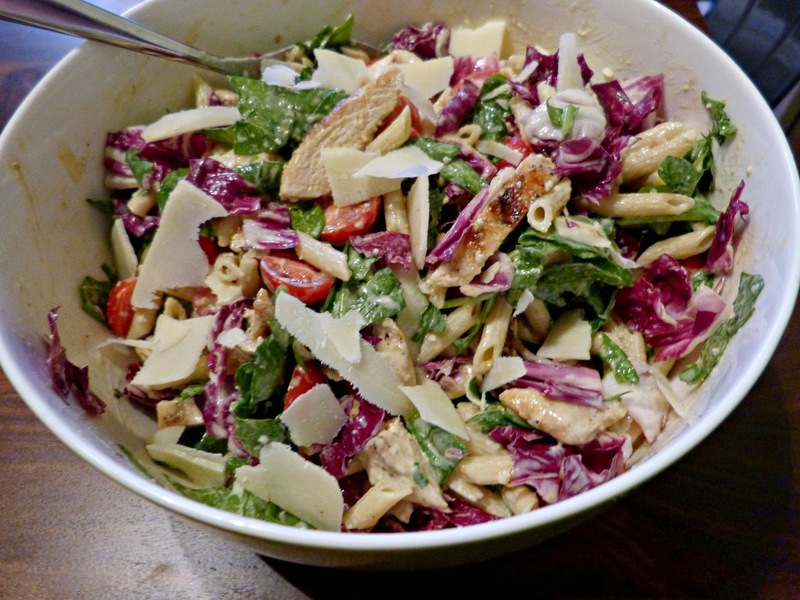 In a large bowl, combine sliced chicken, cooked pasta, radicchio, spinach, and tomatoes. Pour in 1 cup of the Caesar dressing and toss gently to coat. Add additional dressing as desired (this just depends on how much dressing you prefer on a pasta salad). Garnish with shaved Parmesan and serve cold. I am obsessed with Caesars right now! !